04/98 : Acquired TrackStar E.
09/19/98 : Acquired PFS:file and PFS:report for $1.91 each. 01/23/99 : Acquired the Compute book "Mapping the IBM PC and PCjr" for $1.99. 07/99 : Acquired second system with monitor, printer, doc and software for free. 08/05/01 : Picked up a Copy II PC Deluxe Option Board for free. 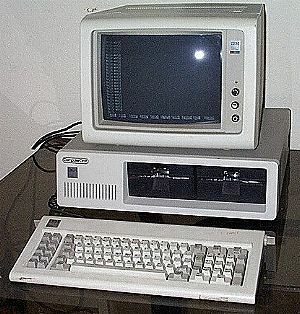 This is the version of the IBM PC with the cassette port on the back but I don't know anyone who ever actually used cassettes on one. It came with dual floppy drives, CGA graphics adapter and a parallel port. If you have anything for one, doc, software, etc. to part with, drop me a line. I now have CP/M-86 booting on the PC. It wasn't easy, I had to first download the distribution images from the Unofficial CP/M Web Site. Then I need to create the disks on a system with a harddrive and a 360K 5.25" floppy drive so I had to take the drives from my AT&T 6300 and connect them to my homebrew 486 to obtain disks to boot CP/M-86. A bit of a pain but an educational experience none the less. I've added the Apple // emulator board, TrackStar, to the system along with a spare Apple // drive. So now my PC can run Apple // software was well.